The quartz pebbles are obvious in this specimen, and in between the gravel you can see the quartz sand. There is some yellow-brown iron staining present, but it is secondary from the weathering of the rock. The next two images (click pictures) show the outcrop the rock came from, and an extreme closeup of the outcrop. Because these are outcrop pictures they are not as clean as a lab specimen. The rocks are covered with lichen and dirt. But that does not change the fact that on close inspection they are quartz sandy conglomerates. Quartz rich sands and conglomerates are theoretically associated with periods of greate tectonic stability, and generally it requires those conditions to generate such rocks. This specimen, however, comes from the middle of a clastic wedge, surrounded above and below by immature sediments. So, theory is not always right about the specific conditions in which we *find* such rocks; the natural world is just to complex to always fit our simple models. The theory is right, however, about the conditions required to *generate* such rocks. It requires tectonic stability to generate 100% quartz sediments, and the concentration of quartz in this sample originally formed in tectonically calm conditions. 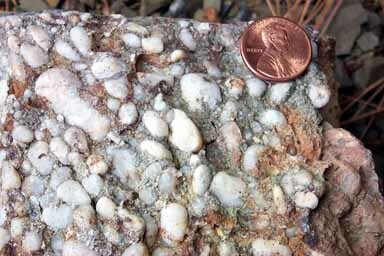 The reason this rock is now found in a clastic wedge is that the quartz sand and gravel was weathered and eroded from a quartz dominated formation in the sourceland that itself was generated under tectonically quiet conditions. As the quartz rich source-land rock weathered out it released a volume of quartz pebbles and sand that washed down the rivers more or less together to be deposited in the clastic wedge, where we found this specimen. This particular specimen comes from the Greenland Gap formation (old Chemumg) of eastern West Virginia. It is part of the Catskill clastic wedge. It was deposited either in a river or proximal submarine fan environment - in any case, a high energy environment.